The Orange County Board of County Commissioners recently recognized several local service organizations during the County’s fourth annual Recognition Day for National Service in keeping with the national initiative led jointly by the National League of Cities, National Association of Counties, Cities of Service and the Corporation for National and Community Service. Mayor Teresa Jacobs and Orange County’s six Commissioners presented the National Service Recognition Day Proclamation to local service organizations at the Board of County Commissioners (BCC) meeting held on April 5, 2016. Corporation for National and Community Service (CNCS): The CNCS Florida state office is located in Orlando and has more than 1,800 locations throughout the state. It serves citizens and provides services that include tutoring, mentoring and volunteer support. In 2015, CNCS committed more than $39 million through initiatives to support the communities and citizens in Florida. AmeriCorps: In 1993, President Bill Clinton signed legislation creating AmeriCorps to connect Americans of all ages and backgrounds with opportunities to give back to their communities. 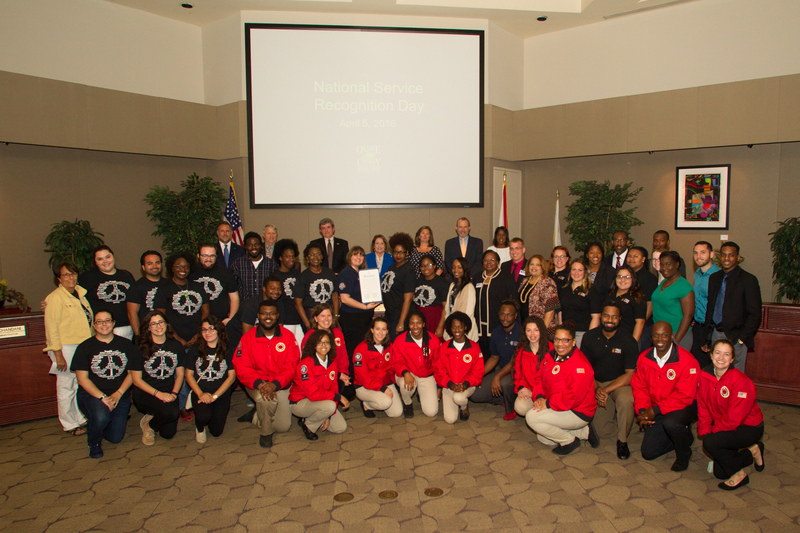 The Florida Legislature created Volunteer Florida in 1994 to administer AmeriCorps in Florida with the first class of AmeriCorps members serving the state that year. City Year Orlando: As one of AmeriCorps’ 26 programs in Florida, City Year Orlando’s mission is to help at risk children in low income areas reach their full potential. City Year service members work closely with the Orange County Public School system to tutor, mentor and guide students towards a successful future. According to City Year, 63 percent of students in grades six through nine improved one letter grade in English with the tutoring help of their 65 service members. Heart of Florida United Way: Every year, United Way gives Orange County employees an opportunity to give back to the community and help fellow neighbors. In 2015, Orange County employees contributed an impressive $501,745 to the local non-profit through fundraising efforts. For 90 years, Heart of Florida United Way has been at the forefront of health and human care services in Central Florida. Proclamations were also presented in recognition of Sexual Assault Awareness Month in April and Earth and Arbor Day on April 22. To view photos from the April 5 Board of County Commissioners meeting, visit Mayor Jacobs’ Flickr album.